When Star Wars: The Force Awakens hits Blu-ray and DVD this spring, we've already been assured by director J.J. Abrams that we're not getting an extended director's cut. But we will get to finally see some of the deleted scenes from the blockbuster sequel. While we've been told about a few of these moments before, editors Mary Jo Markey & Maryann Brando have now offered even more insight into what we might see when Star Wars 7 hits home in April. 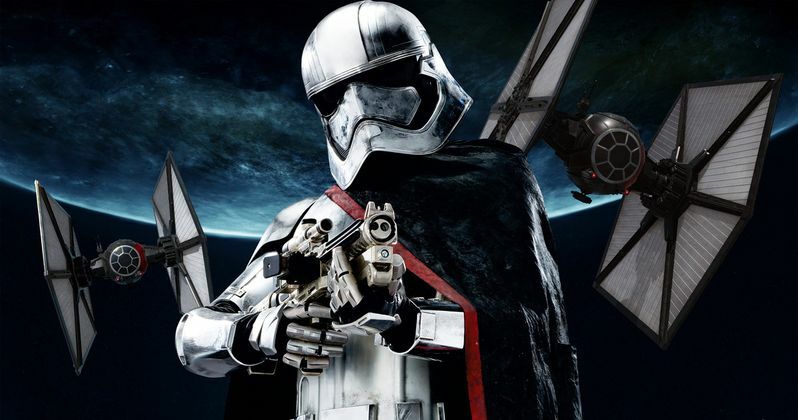 Many believed that Gwendoline Christie's Captain Phasma would be the breakout character, and become a fan favorite on par with Boba Fett. But once the movie debuted this past December, it was obvious her screen time had been scaled way back. While the First Order Stormtrooper leader will have a much more substantial role in Star Wars: Episode VIII, we'll probably get to see more of her in just a few short months. While we didn't get to see it on screen, it sounds like Finn, Han and Chewbacca successfully threw the woman down the garbage chute as they had planned. About this deleted scene, the editors had this to say. "There was actually a fun thing with Captain Phasma ordering all of the ships into the air, but they didn't realize that Han and Finn had just thrown her down a garbage chute." Chewbacca also had much more substantial screen time in the first cuts of the movie. But his part was scaled back to make room for newer characters. One of which is Unkar Plutt, the junkboss of Jakku played by Simon Pegg. Unkar actually had a second scene away from Jakku that doesn't end well for Rey's former food supplier. Here's what Mary Jo Markey & Maryann Brando had to say about one of Chewbacca's better deleted scenes. "There is a scene in the cantina, or our version of it, the Maz castle, where Rey, once she separates from Finn and wanders off, and Unkar Plutt is there, because he's been tracking her because she stole the Falcon from him. And they have a confrontation and Chewie comes in and rips his arm off. It became a problem because emotionally it just didn't track with the story. But it was a really funny scene." Another key scene that was left on the cutting room floor is an interaction between Maz Kanata and General Leia, that happens once everyone returns to the resistance base after the raid on Maz's Castle. A few seconds from this scene can be seen in the trailer, which shows Maz handing Leia her brother's original blue lightsaber, which used to belong to her father, Anakin Skywalker. There is also a notoriously cut scene involving Constable Zuvio on Jakku, a character that got quite a few toys but didn't actually make it on screen. What do you think? Are you even more excited about Star Wars: The Force Awakens's debut on Blu-ray and DVD?